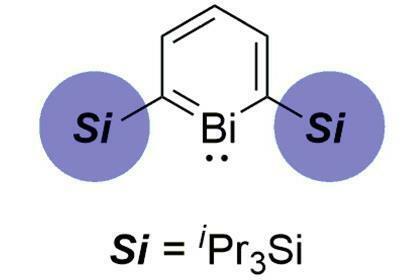 Researchers in Japan have isolated the first stable bismabenzene, a benzene ring bearing a bismuth atom. Benzene derivatives containing heavy atoms took off as a field of study in 1966, after Gottfried Märkl synthesised phophabenzene. Since then, chemists have prepared several benzene rings where one or more carbon atoms are exchanged for silicon, germanium, arsenic, gallium or even fifth-row elements like tin or antimony. To date, benzene derivatives containing elements from the sixth period have remained elusive. Bismabenzene was first prepared in 1972, but was too reactive to isolate. This new substituted bismabenzene was prepared by transmetalation of an anionic alumina-benzene previously described by the same team. The product was isolated as yellow crystals, which turned out to be surprisingly stable: they could be stored for over three months. The team also explored the chemistry of bismabenzene, discovering that it can undergo [4+2] cycloadditions with some unsaturated carbon–carbon bonds. The researchers also speculated on the aromaticity of this new derivative. By examining bismabenzene using a number of techniques and computational experiments, they came to the conclusion that the compound may well have an aromatic character.